The global aluminium oxide market is expected to witness a CAGR of approximately 4.6% during the forecast period, 2018 - 2023. The major factor driving the market is the rapid increase in demand from pharmaceutical, medical, and electronics industries. 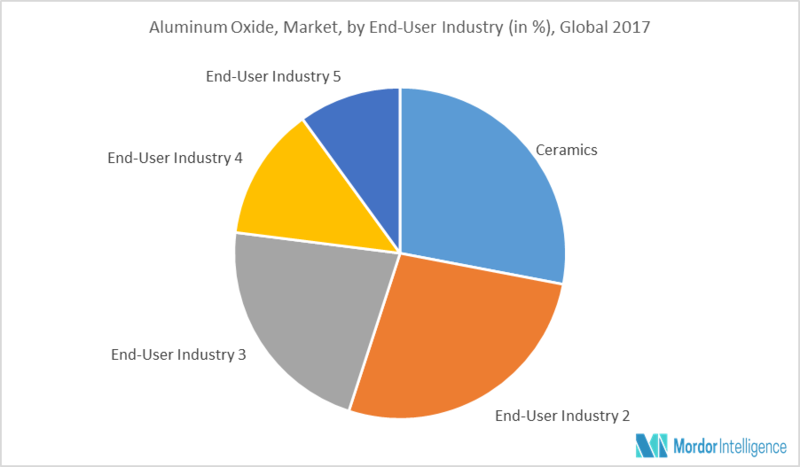 The demand for aluminium oxides has been at a rise from various end-user industries, primarily from ceramics and electronics industry. Aluminium oxide offers high thermal conductivity in ceramics industry and ductility in the electronics industry, due to which it is highly preferred for usage in thermal test machines. Such factors are expected to drive the market for aluminum oxide during the forecast period. Aluminium oxide is majorly used in transplants, making dental cements, and in hemodialysis in the medical sector. There has been a significant increase in the demand for such treatments due to the continuous surge in the number of health and dental issues, globally, primarily due to rise in ageing population. Consequently, resulting in an increased demand for and consumption of aluminium oxide in the medical sector. Asia-Pacific is expected to witness the highest demand for aluminium oxide during the forecast period, owing to the emerging applications of aluminium oxide in the pharmaceutical and medical industries. The demand is majorly expected to rise from the developing nations in the region, including China and India. The pharmaceutical companies are significantly involved in pushing the research and innovation in India. In 2017, the top five pharmaceutical companies, SunPharma, Lupin, Aurbindo Pharma, Cipla and Dr Reddy’s Labs, together spent over 8,000 Crore INR. Such investments and development in the pharmaceutical sector are expected to increase the demand for aluminium oxide, which, in turn, shall benefit the market. North America is expected to witness the second highest demand during the forecast period. Major Players: Albemarle Corporation, GIFA, VEGA, Washington Mills, and WR Grace, among others. 9.7 Snam Abrasives Pvt. Ltd.
9.11 WR Grace & Co.-Conn.